13th March 2016 – AMS Inc. 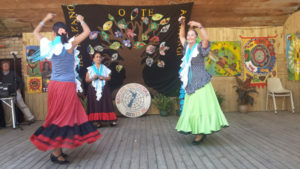 It became evident from the start of the Auckland Multicultural Society’s Lakeside Festival on 13 March that it would show dramatically the diversity of cultures making up Auckland and North Shore communities. Two comperes, working well together took the stage. The first, president of the Society and Tibetan community leader, Thuten Kesang QSM is the official representative in New Zealand for His Holiness the Dalai Lama. The second presenter of the show was Annieliza, a Filipina, who is married to a Dutch migrant, Mr Hermsen. They are both members of the Auckland Dutch dancers group. The two MC’s presented a smooth-running brilliantly colourful stage show bringing together performers of 17 different ethnic backgrounds from Asia, Europe, South America and other countries who have made Auckland and the North Shore their homes. North Shore MP Maggie Barry, Minister for the Environment and the Elderly officially opened the festival, saying with pride that she has an Irish background. 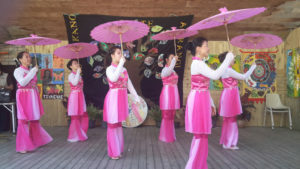 Another guest, Melissa Lee, the first Korean to be elected a member of New Zealand’s Parliament, praised the organising committee which has worked for 18 years to stage successive multicultural festivals at the Lakeside venue. There was competition for audiences on the day as the annual dragon boat championships on Lake Pupuke drew large crowds. 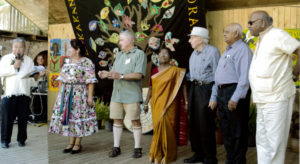 However, the lively amplified sounds of multicultural song and dance attracted a stream of curious onlookers to the outdoor theatre joining the main audience, some of whom stayed to enjoy the performances. One thing was certain, North Shore has an unexcelled asset in Killarney Park, Lake Pupuke and the adjacent PumpHouse as a popular continuing venue for public enjoyment of the city’s outdoor environment. A French flavour was introduced into the afternoon show when La Burée folk dancers took the stage. In complete contrast, the fiery and flamboyant Spanish Fiesta dancers in full length swirling skirts captivated the audience. An expressive dancer, Mouzhgan representing the Sunshine Iranian Dancers wearing men’s shirt and trousers amused all with an impersonation of Iranian men-folk. Guitarists Sandy and Richard from Devonport demonstrated their superb mastery of their instruments as a husband and wife team, accompanied by Sandy’s sister, Marilyn with castañuelas. A talented Korean dancer and teacher Leah Park performed the Korean Anrang dance. Ever popular, the Meadowbank Maypole Dancers represented the English culture. The MY Golden Ballard’s represented by two Chinese musicians on stage, one playing haunting music with a short wooden flute and the other with a traditional Chinese guitar performed the duet Ocarina. They were Chuck Zhang and Minette Tang. The widely travelled Middle East belly dancers Elektra from the ABBRACIA School of Dance in striking costumes were greatly appreciated by the audience. Monique Feron “Zahara” was a pioneer of belly dance in New Zealand, was trained in Egypt and was in demand as the resident dancer on the most luxurious cruise vessel on the Nile. A dancer from Tibet, Kunsang Jigme, was the first ever to appear at the Lakeside concert and captured the essence of traditional Tibetan dance and music in a solo presentation. In keeping with the cultural sharing theme of the festival, the Colour China talented dancers delighted the audience. The Auckland Tamil Community Education group brought the Poonga Tamil dancers to the stage to demonstrate their performances developed over the past 12 years. The most diverse group in the festival called the Joy International Folk Dancers blended the cultures of Taiwan, Japan, Korea, Europe and Russia in their ranks. Among their performing members are also Armenians, Greek, Israeli and Turkish dancers who take part in city festivals. A Spanish guitarist provided the music for Spanish artist and dance teacher, Maria Elena in a display for Flamenco Tierra Mar Nuevo NZ. Two outstanding performers from the Csardas Hungarian Dance Group, Simon and Gyorgyi performed an energetic Hungarian dance. They were followed by Irena, an outstanding belly dancer who was warmly applauded. The final group called Folklore Chileno Latino, under direction of director Ana Maria de Vos are celebrating their 16th anniversary as a dance group. They brought the traditional dancers of South America, already well known for their performances at multicultural events, festivals and weddings. Ana Maria also made history for being the first appointed Latin American Justice of the Peace in NZ. She is also is the treasurer and volunteer co-ordinator of events presented by the Auckland Multicultural Society. Ana Maria teamed up in a delightful folk dance with Edit and their potential male suitor, the strongly built Colan. As the audience sensed the show was nearly over and at Ana Maria’s bidding, dozens leapt to their feet and joined the South Americans dance on stage, celebrating the spirit of the Auckland Multicultural Society’s focus on collaboration, sharing and togetherness between cultures. The event was closed by the president, Thuten Kesang who called on stage all the executive members of the Auckland Multicultural Society. He thanked them for the wonderful job they had done of organising the event. Special thanks were expressed to Ana Maria de Vos who engaged and co-ordinated the performers and John Buckland for making notes and reporting on the festival. Above all, he expressed his appreciation of the performers and the audience for their input to the success of the 19th Lakeside Multicultural Festival..